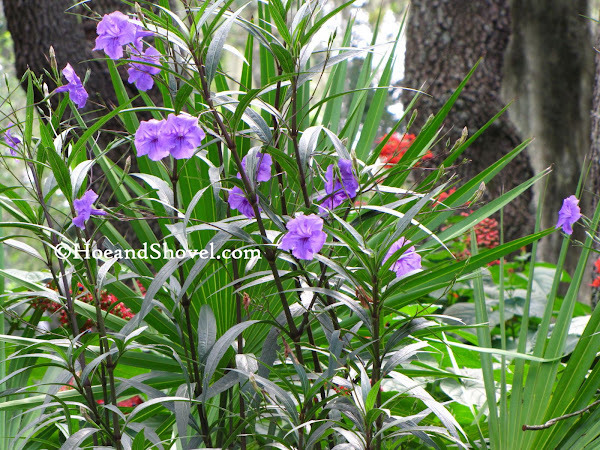 To say Ruellia brittoniana Mexican Petunia is one sturdy plant would be greatly understating its abilities to endure our Florida climate. That's an easy thing to love. 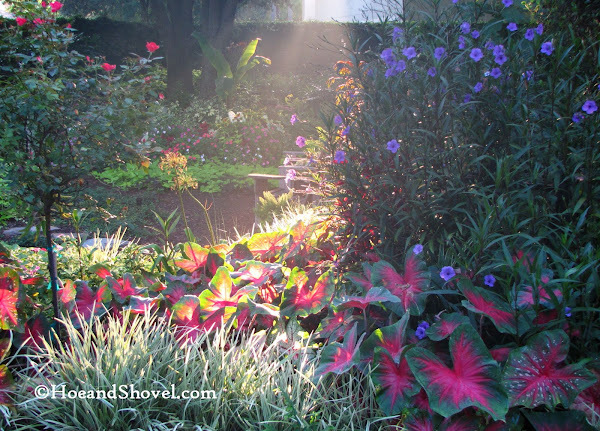 The luscious, almost flourescent, shade of purple it sports means it fits in well and complements just about any other plant and color in a Florida-Friendly garden setting. It grows quickly (very quickly) and fills in large spaces faster than the speed of light. Okay, maybe not that fast... but, trust me... quickly. When you're working with big areas that might be an easy thing to love. The wispy ends of tall, stemmy stalks hold the buds that open each day and close before the sun goes down. In my garden it gets out of hand, in short order, when left to itself for any length of time. Straying out and over its bounds and choking out whatever plants dare to get in the way. There really is a row of red flash caladiums under there. Not so easy to love. I've been a voice of reason for the past few years whenever asked about this vigorous grower. Always advising against the purchase of it unless, that is, you buy Rick Brown's sterile version from Riverview Flower Farms at Home Depot. The sterile variety won't produce seeds. Even so, you should be aware, it has a clumping habit that will spread... and spread with an aggressive rapidly growing, healthy root system. If that doesn't happen fast enough for you pull out any stem, with a few roots in tact, poke it in the ground, and you will soon have more plants for free. Mexican petunia really is a lovely visual respite in the early morning as the first beams of sunlight stream through the branches above. A profuse bloomer it is ~~ the more exposure to sunny conditions ~~ the better. That's easy to love. The site where these are growing was one of the first beds created in the back gardens just over ten years ago. Back then Mexican petunia was perfect there. 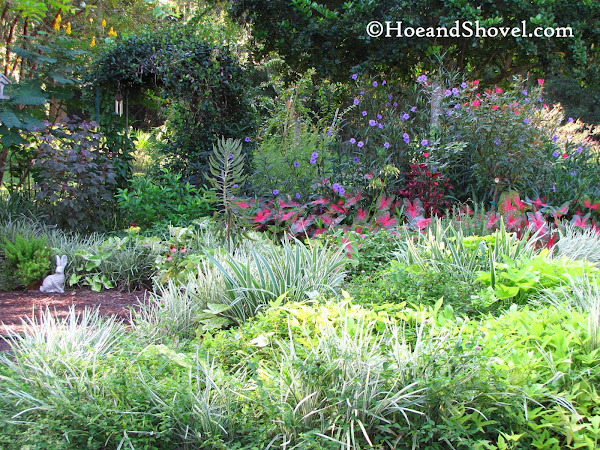 I was asking it to fill in the mostly sunny end of the bed before the ligustrum tree became a tree. There are actually two other locations this pretty trumpet-shaped flower is sited on our property. I did that. On purpose. Not sure what I was thinking. Mexican petunia naturally attracts every variety of butterfly and bees crawl down inside almost disappearing while collecting pollen and nectar. It is one of the places hummers visit with regularity. That's really easy to love. This summer, with the big drake elm removed, increased sunlight provided even better conditions, which encouraged aggressive rapid spreading and more prolific blooming than we've seen in years. Hate the spreading: Love the blooms. Maybe this gardener just needs to get out there and take charge. With a little bit of pruning and pulling up strays by the roots I just might have to admit a turn towards love for this very popular and showy purple bloomer. Perfectly stated, Meems. 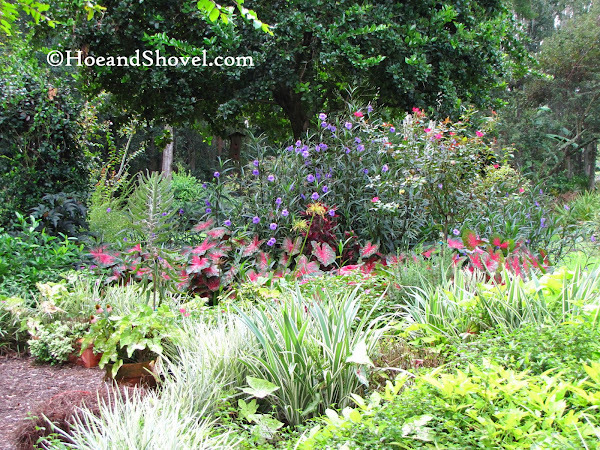 I am just back from Dallas-Ft. Worth area and touring Gardens and Homes with the Garden Writes Symposium. 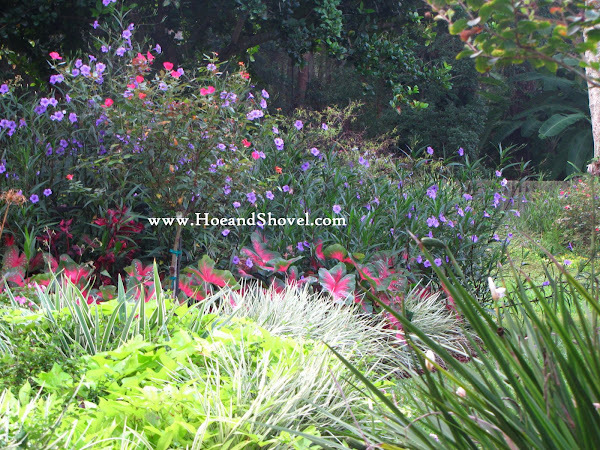 Mexican Petunia is used there in zone 8a too as a dependable perennial. Driving around Florida this year you can see it has really caught on which means more love-hate relationships are developing. New sterile colors are on the way. Your garden is beautiful! Purple is my favorite color in the garden, so I'm afraid I will have to give this one a go! Love your applications. Happy thinning! Over 2 years ago when we bought this house, I pulled out almost all of them. This spring I decided I wanted more. Took cuttings from the ones I had and as they grew, took cuttings from the new ones. Now I have areas of purple with butterflies and bees gathered there. I know some of the clumps will grow too thick, but it's not that hard to thin them out. The beautiful color and the wildlife they draw are worth the trouble. I am decidedly in the "hate" camp with this plant. Planted it 12 years ago before I was aware of its invasive tendencies. It is STILL sprouting in my butterfly bed. Even removing the roots doesn't seem to make a dent in its growth. If I left it alone for even two weeks it would take over the butterfly garden. I have heard of the sterile hybrid but I am just too wary to go that route after more than decade of battling this most tenacious invader. Why fight this plant when there are so many other, less troublesome butterfly plants available? Meems this plant is best suited in an open field with wild flowers. I HATE this plant because you can't get rid of it. They spread like wildfire and the roots are very deep into the ground making it very difficult to remove. I am still battling with some I had planted many many years ago. Loved your garden tour this morning! 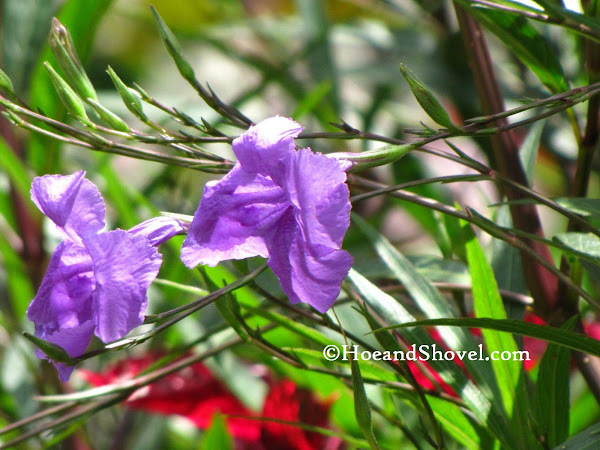 The Mexican Petunia is one of my favorite go to 'gal's' to plant for her graceful purple presence anywhere. I discovered this year what a pretty addition she makes scattered among the red Firespike. Oh girl, I so feel your feelings on this one! I have it too and Arrrrrgh is sometimes the best way to express it. But then again when it gets thinned back it looks so nice in that spot. I am so glad to hear you say it is an aggressive spreader. I have said many times, it is not only aggressive, but invasive. I would never plant another one in my garden. The roots spread and take over everything in its way. I have been pooh-poohed by my stand, but nevertheless, I stick by it. In the right spot, it is beautiful. But, it better have a foot or more of concrete around it and nowhere those roots can go; otherwise, you will find it growing up and over all your other plants...azaleas, roses, etc. There are other purple flowers that are much more agreeable...just saying! I know EXACTLY what you mean! I definitely have a love/hate relationship with this plant. 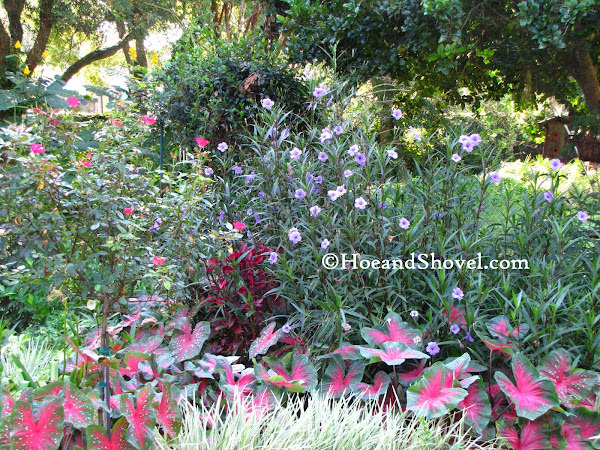 I LOVE purple, and Mexican petunia does fill a few hard-to-fill spots in my garden beautifully. But, mid-summer, it never fails that I have to get my shovel out and thin them out severely. Great post! Yours are beautiful and your photos capture why we put up with such a bully in our gardens. Meems, I love mine, but mine is Rick's sterile version. The color and hardiness of this plant can't be matched. I also like how it blooms fresh every day...a nice reminder that we can all start fresh every day. I'm excited to read Rick's comment that more colors are on the way!!! FUN!!! Hi Meems...This plant really is a "must-have" in the garden...simply because of the variety of wildlife it attracts to it. I planted Rick's sterile variety this year,and have slowly come to love it. It blooms prolifically everyday and attracts...bees, moths, butterflies, wasps, hummers and other insects I don't even recognize. I am, however, watching those runners to make sure it doesn't get out of bounds. 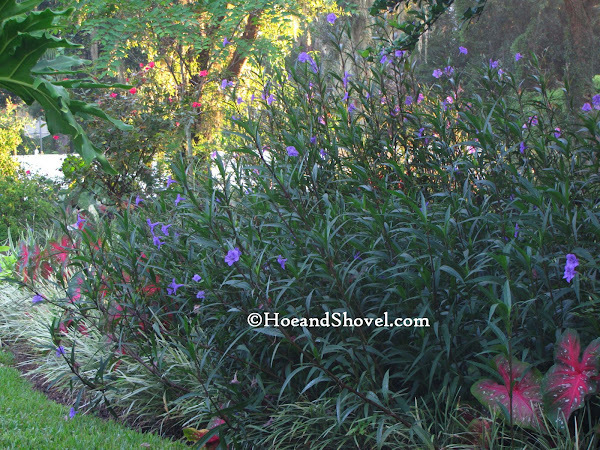 I have teetered on the fence over Ruellia for the past few years. I bought a lovely specimen at the garden center, and in true Floridagirl fashion, looked up the info on it the night after I planted it. What a surprise to read all over the internet that it was invasive! I was dumbfounded that it would even be legal for them to sell an invasive plant like that. Three or so years later, and I'm still watching it. It's clumped somewhat and put out a couple of runners, but is certainly not the worst-behaved plant I've ever grown. Then again, I haven't had it 12 years. 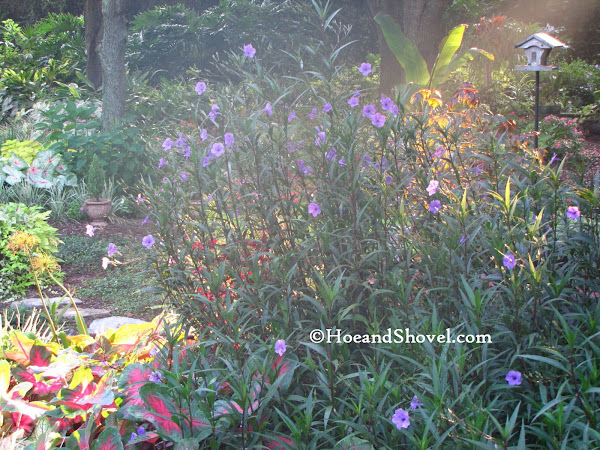 Aggressive or not, Ruellia is a beauty, and I love your sunlit photos. It illustrates so well a random thought I wrote in my purple post a couple days ago: "The soft purple hues of Mexican petunia seem to morph in the changing light. 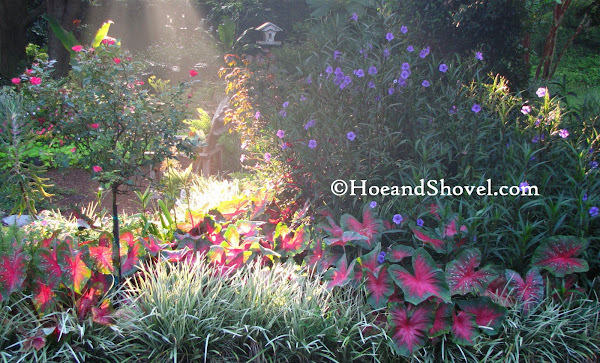 I love the way light falls on these flowers!" Love the color of the flower. Maybe I should try it....it would probably be an annual here? This is on the number one invasive list for Florida. Unless it's sterile, it should not be planted and it should not even be sold. Please rip it out not matter how beautiful it is--it's costing us (both taxpayer & prive moneys) millions of dollars annually to remove it from natural (non-garden) areas where it's crowding out our native flora. See http://www.fleppc.org/ for more details and their list of all the invasives in Florida. "healthy root system." I wish that the taller version flowered as delightfully as the Mexican petunia. Instead it flowers sporadically and leaves an unsightly stem all summer. I can't help but love this plant. I hear you about the ivasive nature of it, but the sterile variety really is controllable. It does have runners but those can be pulled to keep it where you want it. You have yours beautifully placed and really, a sulphur butterfly on one of these purple flowers is worth it all. 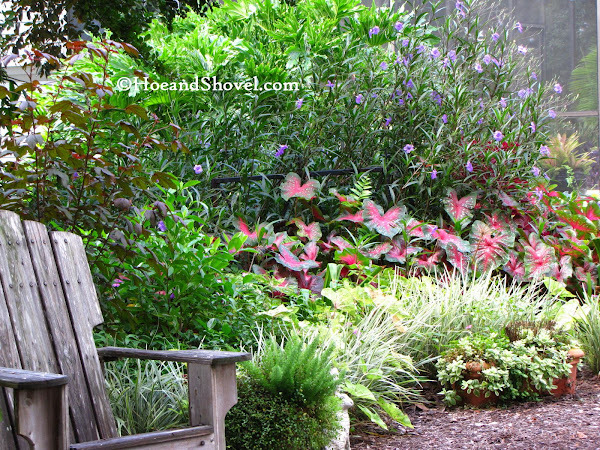 Of course, my garden is still needing lots of "fillers" so perhaps that is another reason I love it so. I'm of two minds also. Love the dependability, hate the "assertiveness," shall we say. I wonder if that sterile one is REALLY sterile? It sure looks good in your garden, though! All of the plants that do well for me in my very sunny, very sandy yard (yes, I amend, but that's a temporary fix) are drought-tolerant self-starters. The price I pay for not having to constantly feed and water is keeping them tamed. And I'd rather do that than pour on the water and fertilizer. I love my purple showers. I got them 8 years ago and I'm pretty sure they were Home Depot (Rick's) because they are very easy to contain. I have to pull some up, but I do the same with my cosmos, pagodas, salvia, plumbago -- all of my great, low-maintenance, high-color bloomers. There definitely is such a thing as a too-successful plant! Meems - the past few times I've visited your blog, the comment section has been showing up on top of your post. Has anyone else mentioned this problem? Maybe it's just my computer. I agree with the love/hate relationship with Mexican Petunias. I live in the panhandle of florida and they still sell it here. I didn't realize it was taking over our native flora. They should make it illegal to sell, as they have other plants like water hyacinths. I've taken more criticism for writing about this plant than any other. I have a love/ hate with it as well. I agree about not buying it. A neighbor most certainly has it and it grows so well from cuttings. I've grown it with some success in pots, which might work for anyone concerned about it's invasiveness. Wow... Opened up a Pandora's box here. It seems either LOVE or Hate and no in-between with this one. In previous posts regarding this plant I covered the fact that it is on the invasive list of plants for Florida and we would NEVER advocate purchasing and planting anything on that list. Plants that displace our native flora should not be propogated or purchased. Again, bear with me as I repeat myself... ONLY the STERILE(not seeding) variety should continue to be purchased and planted. 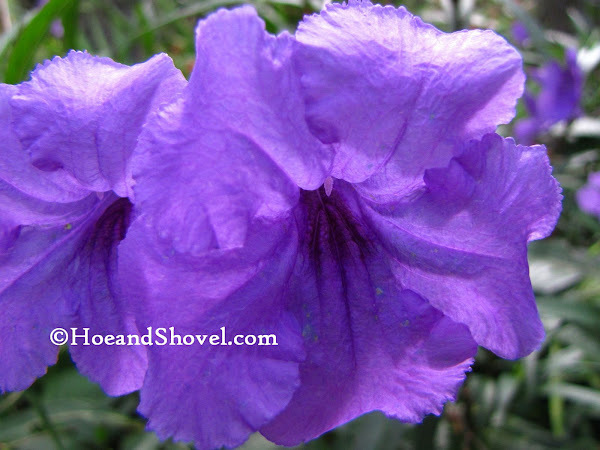 Personally, I don't know of a single other purple flower that has similar enough characteristics to sub out for Ruellia(the sterile one). Any suggestions are welcomed. Anyone who plants the sterile variety should be aware of its clumping habits... much like clumping bamboo. Ruellia IS going to take up lots of space eventually in the garden and the garden will need to have the room to carry it off or the gardener will fight this plant for maybe... forever. This largeness is a difficult thing to envision when a 6" plant is initially planted in the ground. Thus the example photos of my garden in this post. Thank you all for your input!!! It is very interesting to say the least to hear all the various perspectives. has anyone every cut out the bottom of a 5 gallon bucket and planted the entire bucket in the ground with the plant in the middle as to keep it from spreading?